New York, USA -- BUDDHISM’S Noble Eightfold Path, an ancient guide to escaping the suffering of existence, exhorts the faithful to achieve “right mindfulness” and “right concentration” by meditating. The precepts offer no direction, however, on the appropriate design for meditation zafus, the cushions on which Buddhists pursue enlightenment. 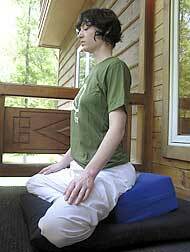 Amanda Yates uses a Tibetan Mountain Seat, a cushion that is intended to ease physical strain during meditation. “Traditional cushions contain either kapok, which is a natural fiber, or buckwheat,” explained Ron Hogen Green, a monk at the Zen Mountain Monastery in Mount Tremper, N.Y. “There are problems with both of them.” After extended use, buckwheat and kapok stuffings tend to develop lumps that can put stress on a meditator’s spine, Mr. Green said. About four years ago, he approached his monastery’s abbot, John Daido Loori, about creating a new cushion that would ease the physical strain of sitting cross-legged and motionless for upwards of 35 minutes at a time. Mr. Green says he believes that this is a particular concern among the large number of people who took up the religion in the 1960s and may be experiencing joint and muscle problems as they age. With the volunteer assistance of orthopedists, Mr. Green designed the circular Mountain Seat, a meditation cushion made primarily from a decidedly nontraditional material: viscoelastic foam. Mr. Green got the idea for using this springy, artificial material from a piece of direct mail. “Around that time, Tempur-Pedic was sending out a lot of mass mailing samples,” he said, referring to the Swedish mattress manufacturer. Though the viscoelastic swatch that he received in the mail did not persuade him to buy any Tempur-Pedic products, he was intrigued by how the foam reliably snapped back to its original shape. Monks sewed prototypes by hand, then used them for meditation and offered feedback to Mr. Green. An all-foam model was found to be a bit too soft, so a layer of buckwheat was added to the cushion’s base. The buckwheat compartment is zippered rather than sealed, so hulls can be removed or added to individual tastes. 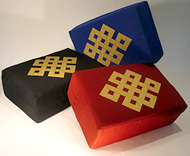 Money from sales of the cushions, which come in three sizes, goes back into the monastery. Dharma Communications released a follow-up last year, the Tibetan Mountain Seat. Rectangular rather than circular, and lower-slung than its Zen-inspired predecessor, the new zafu is designed for Tibetan Buddhists, who often meditate with their knees touching the ground. The Tibetan Mountain Seat, at $125, costs more than the originals, which are priced at $85 to $95. (All are available at the monastery’s online store at www.Dharma.net/monstore.) But if some Buddhists can more easily attain enlightenment on the Tibetan version, it is unlikely that they will complain about the extra expense.